I like taking pictures. I’m extremely novice at it, as anyone can see, but I enjoy it just the same. I don’t do a lot of that touch-up stuff, although I might crop or increase the vibrance of a photo on occasion. That’s about it. I don’t have a professional type camera with all of the bells and whistles, but I like what I have. In the past, I’ve been disappointed with lots of photos that I’ve taken, and wished for a “better” camera, like a Nikon or a Canon. But usually I find out the issue isn’t the camera, but the photographer’s lack of knowledge and experience in getting the camera to do what I’d like it to do. This is the longest driveway ever! Rudy’s was PACKED just one hr before closing! I saw this from about 1 mile away! Such striking color! 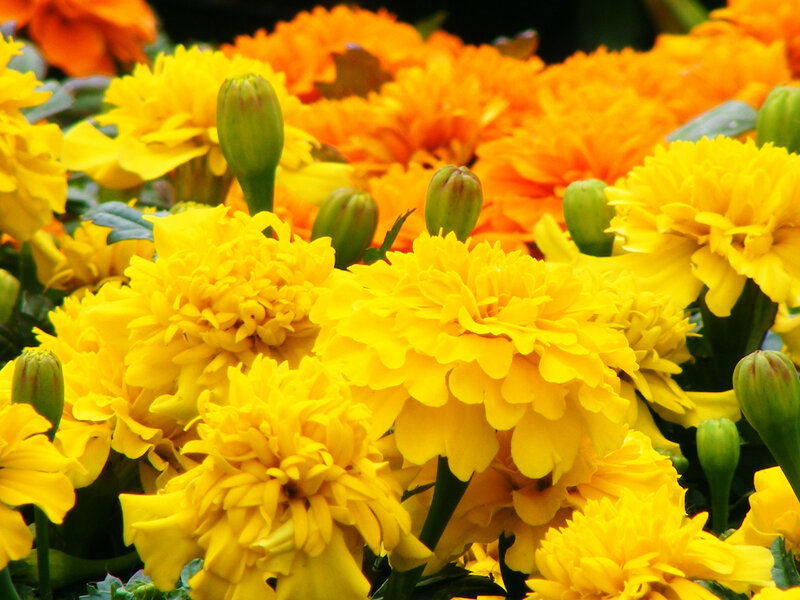 Marigolds are hardy, annual plants and are great plants for cheering up any garden. Broadly, there are two genuses which are referred to by the common name, Marigolds viz. Tagetes and Celandula. Tagetes includes African Marigolds and French Marigolds. Celandula includes Pot Marigolds. Marigold (Calendula) is an extremely effective herb for the treatment of skin problems and can be used wherever there is inflammation of the skin. In South Asia, bright yellow and orange Marigold flowers are used in their thousands and placed in garlands and to decorate religious statues and buildings. They are also used as offerings and decoration at funerals, weddings and other ceremonies. Pigments in Marigolds are sometimes extracted and used as a food coloring for humans and livestock. But I like them simply because of their pretty color and long lasting beauty! Okay, I admit it… I instigated this challenge. The winter has dragged on so-o-o-o long here in Central New York that I kinda lost it and got a little depressed. However, things are slowly turning around and it’s warming up enough for some of my flowers to bloom, despite the frost we had again last night. I was just hoping for a pick-me-up of some sort, and Cee answered my prayers with the four seasons. Thanks, Cee! Unidentified pretty yellow flower in my yard. Sometimes I like to just mess with the settings on my camera, getting to know them, and attempting to explore all the different things I can do with my little Finepix S700. This past weekend I tried some macro (up close) shots, as well as a variety of other things. I particularly like macro when photographing flowers. My cat? Not so much! I get so excited to see the peony bushes push up through the ground! If you’re familiar with me at all, you’ll know that our little piece of the world, our almost three acres of God’s goregous earth, is lackluster in nutrients to support plant growth. It used to be a farm field, used for corn and Lord knows what else. When we purchased it, we did not realize that all of the nutrients necessary to support things like GRASS in the front yard, trees, perennials and such are no longer there. It has been a 9-year struggle to get anything pretty to grow, even after we’ve tried various avenues such as weeders, feeders, etc. It’s not feasibly affordable to keep Miracle Grow-ing our acreage. Anyway, I digress! So each Spring, it’s with hope and excitement that I wait to see what, if anything, will “return” and … flourish? My trees are most precious: my King Crimson maple that my children got me, my pin oak trees that appear to be truly established and out of the danger zone, and (of course) my newly-planted red oak tree ~ my Kirkwood ~ planted last summer. We also have flowering trees, shrubs etc. that, after 7-8-9 years are still struggling to flower, let alone flourish. And I haven’t even mentioned our “grassy front yard” that I mow every weekend through Spring and less often into Summer. All I can say is that it’s “green” ~ but not due to grass, but a variety of weeds. It actually looks nice from the road, but when I’m mowing it, I get depressed at the hideousness of the weeds. What I would’t give to till up the whole “front 40” and plant grass seed and actually have grass GROW! But, I digress yet again in my rant. My whole reason for posting was for you to enjoy some macro shots I took. I should be thrilled that we even OWN a piece of God’s creativity! And I am! It seems we’ve been all about colors in the past few weeks. Here’s where we get to choose one color and share it with you through photography. Although I adore the color red, I chose purple this time ~ as it reminds my of my favorite Spring time flower… the lilac. Spring can’t come soon enough for me! How could I quilt without this necessity? I’m already looking forward to next week’s challenge! I hope you are too! Thanks for stopping by.